​Wigan are holding talks with other clubs about arranging reserve matches on a "casual" basis this year. They are hoping other Super League outfits will agree to playing a few friendly fixtures throughout the campaign. The Warriors are big advocates of having a second-string side. But they withdrew from the official RFL-organised competition when they saw the fixture list and discovered only two other Super League clubs - Hull and Wakefield - were taking part, along with lower league outfits. Executive director Kris Radlinski remains hopeful a reserves is mandatory for Super League clubs in 2020 but, in the meantime, he has a string of fringe players who will be struggling for game-time. Wigan have named a 36 man first-team squad for 2019 (the list runs to 37, because the number 18 is left blank for Warriors fans) of which two have left on season-long loans - Caine Barnes to Workington and Josh Woods to Leigh. Of the 34 remaining none of them are eligible to play for the Under-19s. That means head coach Adrian Lam will have up to 17 players who miss out on selection every weekend, and unable to play for the club at U19s. Wigan will continue their dual-registration agreement with Swinton this year and are exploring other loan options, as well as speak to clubs about arranging their own reserve-level games. “We certainly will have to have casual games organised and we’re already involved in conversation with the other obvious clubs in that respect," said chairman Ian Lenagan, who said he was "bitterly disappointed" a competitive reserve league didn't get off the ground for this year. “Unfortunately, Super League doesn’t control the reserves. That has got to be controlled at the RFL level and there’s a great requirement, a great belief that we need a reserves structure in order to develop properly as a club and as a league." Lower-league clubs are only allowed to take up to four dual-reg players each game. And Radlinski says getting players tied-up with other clubs has brought other challenges. "Not many clubs will commit at this early part of the season to loans or dual registrations because they don't have many injuries," he said. "We have a big squad and we'll probably look to arrange a few (reserve matches) but we won't be taking part in the 'official'; competition, shall we say. Even though we strongly believe in it." Until a few years ago, clubs operated a three-tier system with the first-team backed by an Under-21s and an Under-18s. This was scrapped in favour of a single academy team, U19s - with no provision for older players - in a move many regarded to be a cost-cutting exercise. 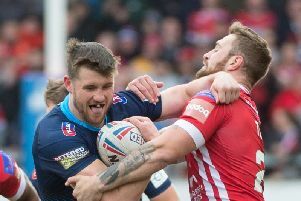 Some clubs later set-up reserve teams and played each other on a friendly basis but St Helens and Warrington, as well as Wigan, decided against taking part this year. Super League's chief executive Robert Elstone conceded making the competition attractive - and securing a lucrative new broadcast deal - were his priorities, but it was an issue which needed attention. “The honest answer is that we’ve got an 18-month focus on getting the best broadcast deal; creating fantastic youth development pathways is not going to impact in that window," Elstone told a media briefing yesterday. "But for the long-term prosperity of the sport, we need to get more people playing and more to the start line as a professional Super League player.